Bazooka Screen - a 304 grade stainless steel mesh screen. Ideal as a filter screen for a mash tun or brewing kettle. Comes with 1/2" stainless BSP thread and stainless clamp. A stainless steel mesh Bazooka T Screen with 1/2" copper fitting. 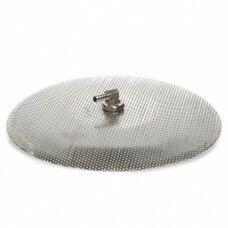 This is a domed false bottom made from stainless steel. It comes complete with stainless steel elbow and 3/8" barbed outlet. These false bottoms are often used for helping to construct a mash tun. Manifold for Mash Recirculation, intended for, but not limited to, the Ss InfuSsion Mash Tun.